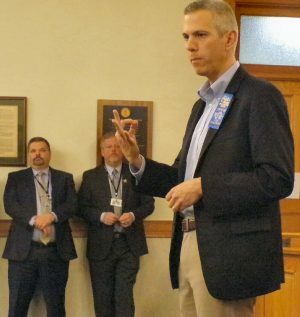 OSWEGO – Congressman Anthony Brindisi (NY-22) toured the Port of Oswego today (April 11) to learn more about the work they do and issues they are facing, including tariffs and high Lake Ontario water levels. Congressman Anthony Brindisi addressee members of the legislature. In the background are County Administrator Phil Church and Chairman James Weatherup. 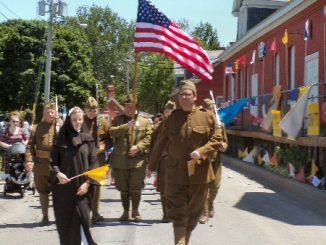 He followed that up with a visit to the Oswego County Legislature’s meeting Thursday night. In 2017, Lake Ontario flooding caused serious damage to local businesses, residences and infrastructure. Brindisi said he and Congressman John Katko (NY-24) sent a bipartisan letter last month to the International Joint Commission requesting immediate action to prevent more devastation in these communities already working to respond to existing damage. He said he is trying to work with people on both sides of the aisle to get things done in Washington. He cited his efforts with Katko as an example. “We had a meeting last week regarding flooding on Lake Ontario,” he said. He is a member of the veterans and agriculture committees. Repairing the infrastructure is also high on his priority list. He’d like to see a partnership between the federal government, the state and the localities to put forward an infrastructure package. “Let us know. 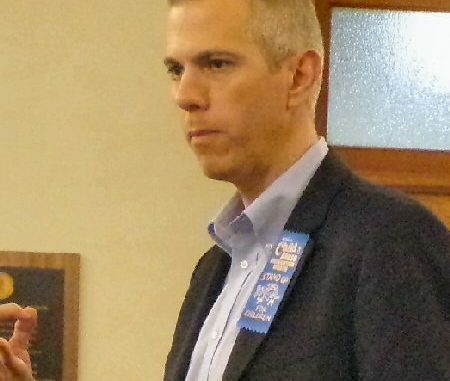 We’ll do the digging; provide you with many options that you can apply for and we can help lend some support,” Brindisi added.